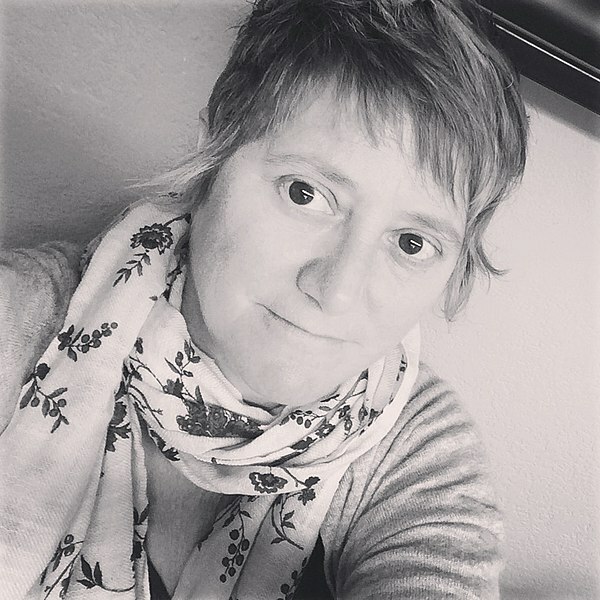 Dr. Carol A. Stabile is Associate Dean for Strategic Initiatives in the College of Arts and Sciences and a Professor at the University of Oregon. Last term, she taught with Wikipedia in a course at the University of Maryland, Racialized Gender and Rebel Media. Here, she walks us through her process. Image: File:Stabile photo.jpg, Castabile, CC BY-SA 4.0, via Wikimedia Commons. This past term, I taught a course on gender, race, and media that asked students to experiment with some of the building blocks of social movement communication. I wanted students to write about issues they cared about—issues affecting them and their diverse communities. I warned students that the class was highly experimental and that I didn’t know if everything would work the way I’d planned it. I was lucky: the students in this general education class were politically engaged, plucky, and smart. Above all, I wanted our class to do work in the world, to use an axiom from the Black Arts Movement—to teach students writing and media skills that they could use as citizens engaged in transforming the worlds of work and politics they soon would enter. On the last day of class, I presented the results of their semester-long efforts—efforts that had already had an impact on the world around them. These included change.org petitions (several had hundreds of signatures—one had been signed by over 1,000 people); Instagram posts and Tweets that shared their hopes, concerns, and passions with broad audiences; op-eds and letters to editors about issues ranging from a bill being considered by the Maryland Legislature banning conversion therapy for LGBTQ teens to the need for gun control to prevent school shootings. The centerpiece of my presentation that day was five significant contributions to Wikipedia that students had completed for the course. These Wikipedia assignments taught them skills that helped them think about all their work that term. In the first place, the assignment encouraged students to reflect on the differences between primary and secondary research, as well as the crucial relationship between the two. At a time when research and scholarship are being actively disparaged, their work on Wikipedia showed them just how vital scholarship is to knowledge production and consumption. In turn, these assignments caused them to consider their own responsibilities as media producers—to facts, to research, and clear thinking and writing. Where did the information they were retweeting or posting to Facebook come from? How neutral and reliable was it? But if you’re reading this on Wiki Education’s platform, you already know how transformative these assignments can be. What really made this particular class unique, I think, is that in keeping with the course’s student-centered focus, I tried to create a structure for students to brainstorm, select, and work on topics they considered important and were passionate about, rather than selecting from a menu of topics that I had provided in advance. There are of course good reasons to preselect topics. For students, being able to choose from a menu is easier and perhaps less anxiety inducing, since as the instructor, you’ve already made decisions about whether the topic is going to meet notability criteria and you’ve done enough research to determine whether there’s sufficient secondary material to write an entry. For instructors, moreover, assigning topics can involve less labor than working with students to select topics, troubleshooting issues owing to notability criteria, and modifying topic ideas as necessary. But allowing students to select assignments they generated and thus are meaningful to them really changed the nature of the assignment. It allowed students to grapple with the limitations of notability. How do you create an entry for a young computer scientist from Kenya, who is only mid-career? Can you make an entry for a female mathematician about whom secondary research is sparse? 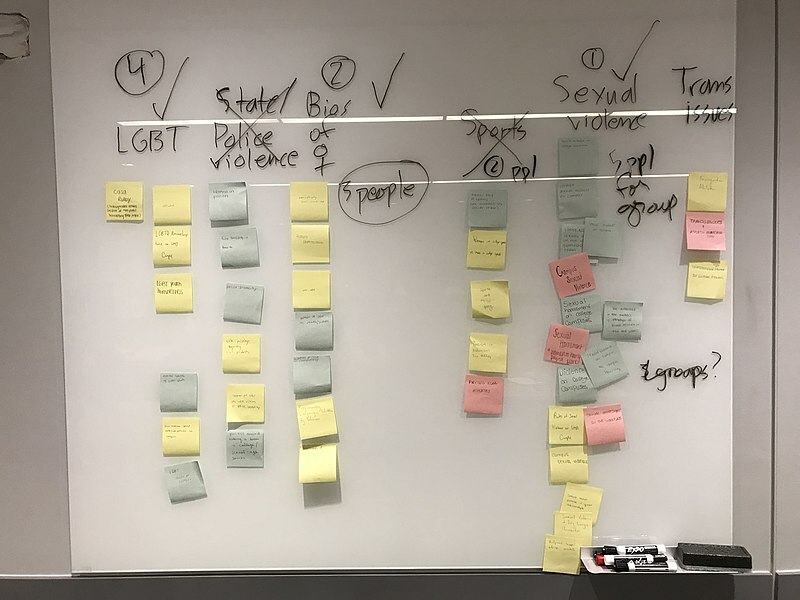 It further encouraged students to think about gaps in the online encyclopedia and allowed them to address these, as one group did by adding a section on LGBTQ students to the entry for campus sexual violence. 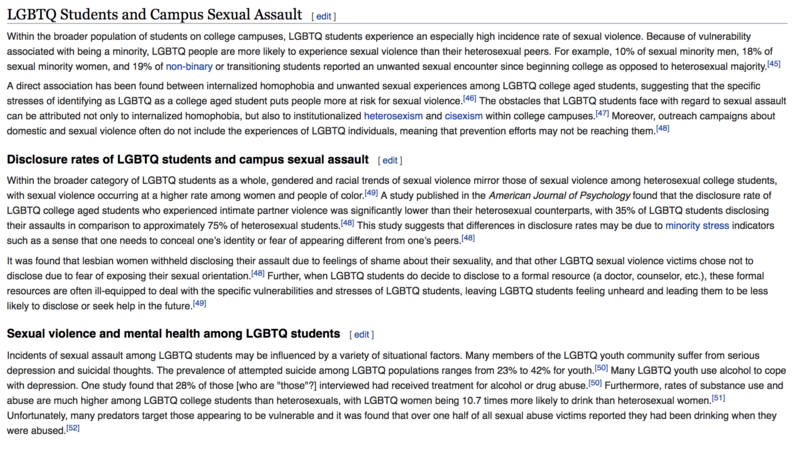 Screenshot of Campus sexual assault Wikipedia article. And it also allowed them to think about themselves as producers of knowledge they generated, rather than as workers filling in gaps I had decided were relevant. To devise a process that let students collaboratively create a set of groups that reflect their own priorities, we used a process for agenda development described in Adrienne Maree Brown’s Emergent Strategy, made up of the following steps. 1. I asked students to take ten minutes to list three topics that they would be interested in writing entries for, making their topics as specific as possible (small is good, Brown reminds us) (when I do this again, I will have students work on this in advance as a homework assignment). 2. They then wrote each topic idea clearly and concisely on individual post-its. 3. The first person to complete their post-its created a column for each post-it on the whiteboard in the front of the room. As people completed their post-its, they reviewed what was already posted and either added to the existing columns or created a new one if nothing on the wall fit into the columns. 4. Once all students had completed and posted their topics, we read through and named each column, revising as necessary, and creating a name for each column. The process we used to determine Wikipedia topics for student collaborations. And the final group wrote about menstruation and education. Of course, this process is just that—messy and imperfect. For example, students didn’t always get their first choice of topics and some students were more excited about their topics than others. I didn’t think ahead to limit the number of students per group—some groups wound up being bigger than others, with consequences for the amount of work they could undertake and the size of their entry. Students also had to adjust their topics as their research proceeded in order to complete the assignment, which would have been frustrating if an excellent subject area librarian hadn’t worked with us to create bibliographies based on the topics students had generated. Overall, I think this process—in all its messiness—helped to connect students with the articles they were writing. I’m going to reflect on it and refine it as I plan for my next course’s Wikipedia assignment. I would welcome hearing about other strategies for working with students to generate topics that inspire them and help to bring diverse people and ideas into Wikipedia. Image: File:UMD stairway.JPG, Bgervais, CC BY-SA 3.0, via Wikimedia Commons.